Customers are opting more and more to use native plants in their landscaping, however, invasive plants and insects have continued to be a menace to local ecosystems. Invasive plants and insects are estimated to cost the USA 40 billion in crop damage, ecosystem, and spread control. Landscapers play an important role in the control of invasive species. 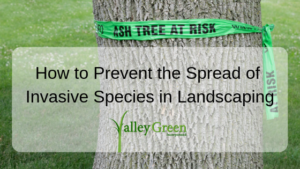 Today we will discuss how to prevent the spread of invasive species in landscaping. Do your part in preserving the northeast’s native ecosystems. Be aware of the current list of invasive native species. One of the biggest threats in the northeast right now is the Asian Longhorned Beetle and Emerald Ash Borer. You can view a list of other invasive species here. There are also several courses you can take on the identification of these plants and animal through the DEEP. If you are working in an area that is known to have invasive plant species growing, clean your shoes before leaving the area to prevent seeds and pathogens from spreading. Report any sightings of invasive species to The US Fish and Wildlife Service. Encourage clients to purchase native plants for their landscaping. This will prevent invasive species from hitching a ride to their yard on any exotic plants that they want in their yard. Don’t take any firewood you have cut from fallen trees across state borders. Be a volunteer at local removal efforts.